The Ministry of Justice (MoJ) is to cut £2bn from its £9bn or so budget. But where will this 20% cut come from? 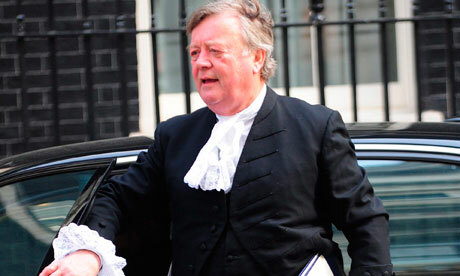 Kenneth Clarke’s MoJ are said to have got in early in agreeing spending reduction targets with the Treasury, and yesterday it was reported by the Public and Commercial Services Union that senior staff were informed by email that the cuts will amount to around £2bn of the overall budget. The Union suspect that around 15,000 of the MoJ’s 80,000 staff may have to be axed. However the MoJ makes the cuts, a reduction of around 20% is likely to have severe effects on access to and provision of justice in the United Kingdom. Various MoJ-funded bodies have already been lining up to explain why their departments could not survive on much less. The criminal legal aid system has long been said to be in crisis, the President of the Family Division indicated last week that the child protection system is in grave danger of imploding, and the Chief Executive of the Supreme Court has said the cuts could cripple the new court. So where will the savings come from? We already know that 157 courts are going to be closed down, which will save a paltry £35m or so. The MoJ also announced in March (at the time of New Labour’s final Budget) that it would deliver £343m of savings as the departmental contribution towards £11bn savings that are being made across Government. That leaves around £1.6bn to go. The percentages are based on a total spend of around £9.2bn, and the figures have been taken from the 2007/8 accounts, which are not easy to follow, so do take them with a small pinch of salt. Those who are mathematically inclined will notice that the total percentages add up to 116%, which is clearly incorrect. This is possibly because the total figure for pay may also be included in other aspects of the budged (e.g. prison workers within the prison services total). That being said, the figures do give a rough indication of how the pie is currently divided, and where the biggest cuts are likely to arise from. The largest areas are staff pay, prisons, criminal defence (i.e. legal aid), probation and the court services. So it is difficult to see how the £2bn will be found without substantially cutting these outlays. More evidence comes from the MoJ’s Draft Structural Reform Plan, released in July. Joshua Rozenberg called it a “mixed bag of plans” in a Law Gazette article analysing the document. However, is difficult to predict any particular direction for cuts from the short document, which is rather vague and mostly speaks of consultation and review – for instance of the prison service – rather than specific figures or targets. The MoJ is also publishing monthly implementation updates, the first of which is here. Along with most other government departments, the MoJ will have to make difficult decisions in the coming months as to how it can make around 20% cuts to its budget. It is not yet clear where the axe will fall, but on a brief look at the departmental budget it is likely that staff salaries, prisons, legal aid and the courts will be first in line. However apportioned, the cuts will have a significant effect on justice in the UK and the pain will be felt for years to come.